I fell in love with these jeans. They aren't thrifted and I thought I might have buyers remorse. But, no!!! I love them. They are technically skinny jeans but finally have enough fabric to cover and a decent waist line. I don't know about you but there is nothing worse than a 50 something sporting a muffin top! I don't usually buy outfits. I must have been in a very springy state of mind to purchase all 3 of these pieces RETAIL. I really don't care I just love the look and might just go back for the turquoise pair. I feel the outfit is young and fresh without desperation.. I thought the cardigan would lend some sophistication but, I'm not sold on how it hangs. Do you think I'm putting old on top of young and fresh? How do you guys feel about the half tuck? I have several showers to attend this spring and after some tweaking I hope this will be my go to outfit. I'm just full of link ups today So click on over to join the fun. 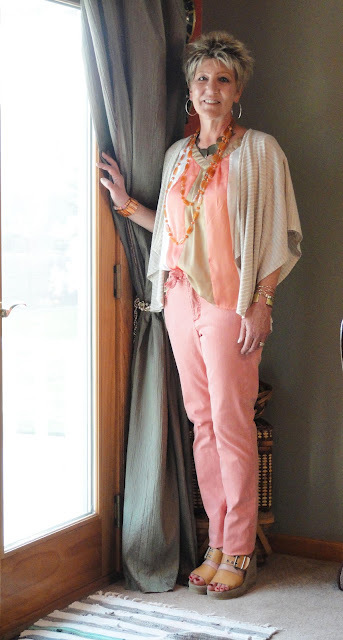 My own personal link is Trending Through the Decades: Pastels. Join in to see how different age decades are styling the pastel trend. Easy as pie (is pie really easy?) Just link up and try to link back to my blog. If it's not to much trouble be proud of your age and put your decade next to your name. One of my favorite link ups is Not Dead Yet Style: Visible Monday...........Go visit and be visible. Another fun one is Monday Mingle. These ladies certainly know how to put it all together on a Monday. Have a great week and get your spring on! Oh, that peach looks lovely on you. Oh, you look so pretty in pink!! I love the outfit SOOO much!! I like everything about it...even the half tuck. Seriously, you should get the turquoise. too! Oh, these skinnies fit you so great. I recently thrifted a pair and thought they made me look pudgy, but I think maybe some heels/wedges may be the cure for that problem. yes i do love the color of your jeans...the color is beautiful. And i also like what goes with it. The top is feminine and flowy. You have just the right colors and accessory for this beautiful spring look. I love this whole look. I think the cardigan looks great with it too. Lovely colors and great fit. those are a great purchase, I love that color on you. That color I need to incorporate into my wardrobe. Tammy, I just bought a pair of crops in a color quite like that. It really looks good on you and that top works! Go for the turquoise pair, you deserve it! I love everything about this outfit: the color, the fabrics, the silhouette, the shoes, everything!!! You look totally chic, fashion forward in an effortless way, and really pretty!! All those things don't always go hand in hand!! P.S. I SWEAR by the half tuck!!! It looks casual, creates a great line, suggests a waistline (which I really don't have) etc. It is the answer to a myriad of fashion dilemmas. LOVE IT!!! I love, love, love the half tuck. Once I started doing it there was no turning back for me! ;) I actually have a cardigan almost JUST like yours that I thrifted and haven't worn yet. I love the whole outfit on you and have been debating on turquoise skinny jeans myself. They have some at Target, but didn't cover as well as I would like! Where did you get yours? Tammy I adore this outfit! You are all pulled together and it is very flattering! What a gorgeous springy outfit on a beautiful lady. LOVE it!!! I really love the peach color on you. the whole outfit is just wonderful. I think you rock skinny jeans! Do get the turquoise ones. I think you could even wear them with the top you have on. I hope to join you for your trending linkup. I have on yellow today. As to the front tuck, not for me. It looks great on you but when you have a round belly like mine it would be a terrible look in my opinion. Anyone with a flat lower ab looks cute. I really like this cardigan and agree with your assessment!! I think a drapey top half nicely offsets your skinny jeans, and the cardigan looks very 'natural' in this outfit. It meshes nicely while letting the more colourful pieces shine. I don't think I own enough pastels to put together a whole outfit worth but I admire the colour combinations on other bloggers. I've posted pastels again today so I might link up again while I'm linky appropriate...! Those jeans are such a lovely hue!